The most eye-catching words on a user’s home page on Twitter and Instagram are preceded by the symbol #. These are called hashtags, and are the source of enjoyment and annoyance of many Twitter and Instagram users. Used to share in a conversation about a topic, they can also be used excessively. Trending topics during a Tuesday afternoon. Screenshot taken by Shira Stein. “I think it’s cool when something’s trending and I actually know what it is. You can find out what’s going on,” responded Carlmont student Anna Shutovska. Viewers might be watching their favorite show like Glee and see #Gleeisback on the tv screen. Going to Twitter and searching that means they can talk with others about the fact that Glee is, in fact, back. It’s a way to connect with other people who have the same interests as them. Although they can be extremely useful, hashtags can also be a source of annoyance. “I think they can be funny, but most of the time they’re annoying. It can be fun to participate in them though,” commented Cristina Oeschger. 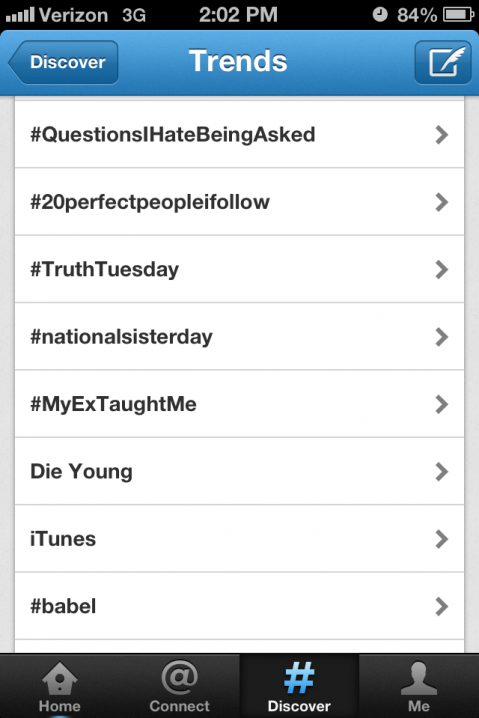 Some popular trending topics include #tbt (throwback Thursday), #ootd (outfit of the day), and #TruthTuesday. In ones such as #tbt, users will post older photos of themselves as a baby or young child. Most users who post #ootd are teenage girls who want to show off their cute clothes. Having trending topics has always been an ongoing phenomenon on Twitter, but regular ones like #TruthTuesday haven’t become more popular until recently. Who knows what trending topic will be the next sensation, but it should be exciting to find out. Hopefully it’s something interesting and fun, but not obnoxious. Next Post What are capreggings?